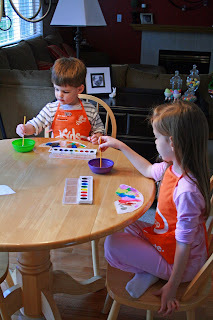 A few weeks ago my little ones were doing art project after art project...we had art drying everywhere! First we did the marshmallow rainbows I posted about earlier...those were a BIG hit--and we still have leftover marshmallows which also is a huge hit. 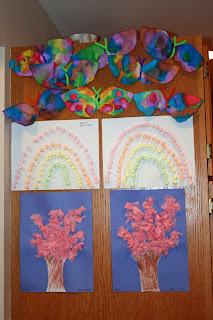 We also made coffee filter butterflies. 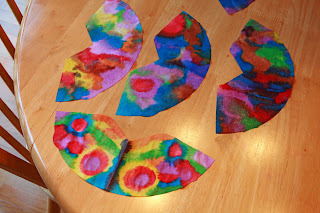 They were enthralled with how the watercolor paint was absorbed into the coffee filters. I even got in on the action and made one. After the filters dried, I added a pipecleaner to the middle of each butterfly. The art project my three year old was most interested in was the cherry tree project I read about on No Time for Flashcards. We had a lot of cherry trees blooming in the neighborhood and he was excited to make a tree like the ones we see on our walks. 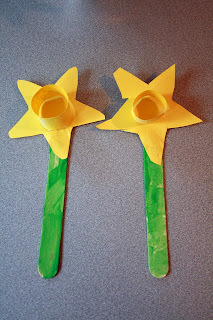 However, my favorite project was making daffodils! 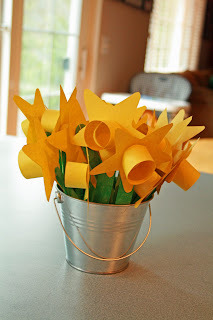 I traced star shapes on yellow construction paper using a cookie cutter. My five year old cut hers out herself and I cut them out for my little boy. Then they painted popsicle sticks green to use for stems. We used Elmers Glue to hold the flower onto the stem and I did the circle in the middle of the flowers. Now I have a bucket of daffodils on my windowsill and love them! 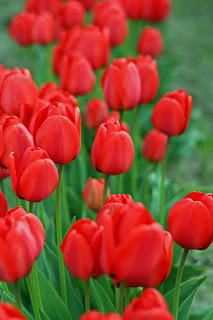 These are a spring decoration I'll be bringing out again next year too! My little ones still aren't back to 100% yet, but they're doing a lot better. 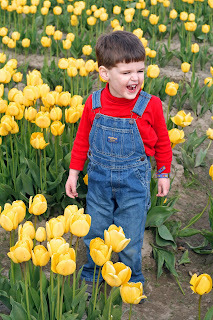 We went on an outing to the tulip fields because we all were going stir-crazy at home! We did some geocaching on our way there and one of the caches we found was near an eagle's nest! 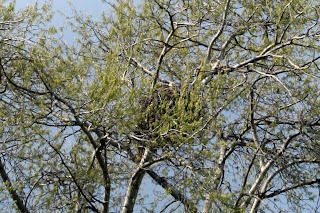 The nest was HUGE--look closely at the picture (or click it and make it bigger!) and you'll see an eagle in the nest. There also was another eagle circling overhead. 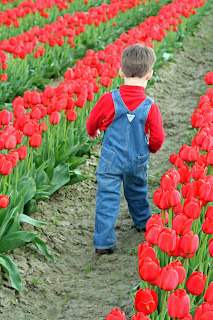 We visit the tulip fields every year during the month of April. It was a bittersweet trip for me this year because of all the memories. 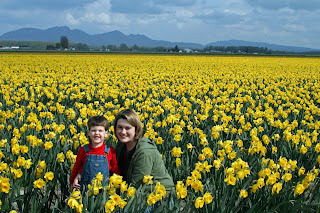 In 2004 we took our little girl to the fields for the first time on her four month birthday--we bought some cut tulips and brought them to my grandma. 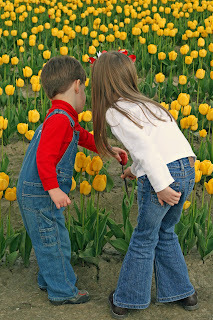 I remember how much she liked the flowers and how she cuddled my baby girl. After she got some good cuddles in, she called my aunts and they came over to see my girl. Now my grandma is gone and my aunts aren't nearly as interested in my girl as they used to be. Sad. 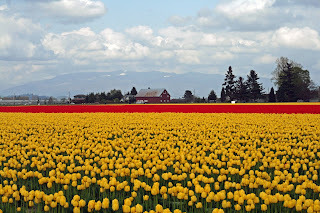 These fields are planted by a bulb company that sells bulbs nationwide. The fields are gorgeous and remind me of the Netherlands. 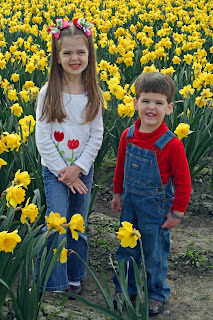 Most of the daffodil fields were done blooming, but we found a few that still were full of color. Anyhow, my little ones weren't willing to do very many pictures this year as they weren't feeling too great, but I did get some good shots. Lots of good sniffing going on! 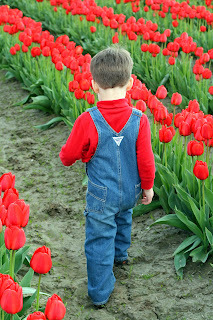 I'm a softie for a little boy in OskKosh overalls! Pretty cute, huh?! Although I do like pictures of people walking away from me, these pictures show his back because he was bellowing "you no take my picture, Mama!! NOOOOOOO!" 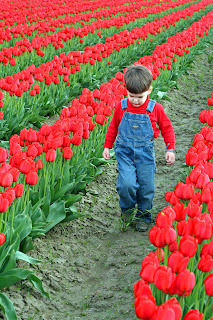 I made him turn around because you're not supposed to walk down the rows (although they turn a blind eye if you just go down a little ways) but he still wouldn't look at me! 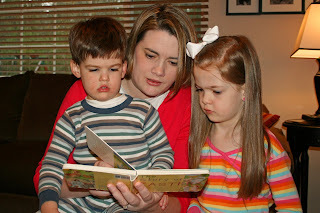 That's okay--I really like pictures where I catch my children utterly absorbed in something. I didn't have as much time to play with my camera as I wanted to have though...maybe next year! My poor little girl has been sick with a high fever (103+) since Monday! 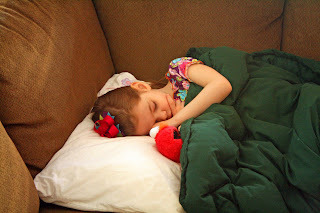 We finally have the fever mostly under control, but she was diagnosed with a sinus infection and an ear infection. Ugh! We have been going stir crazy around here! And then on Thursday morning I took my three year old to see the doctor because his temperature was creeping up and he was starting to cough...and he has bronchitis! Now they're both on azithromycin, so hopefully they'll be on the mend soon! In the meantime, look at this cute tray I bought at Target for under five dollars! It was in the 75% off Easter clearance section last week and I couldn't resist it. I've been wanting a tray for my living room coffee table and this one fits the bill. I may paint it though...I'm not sure yet. I wouldn't have paid the original $20 for it, but just under $5 worked well for me and was a much more appropriate price in my mind. 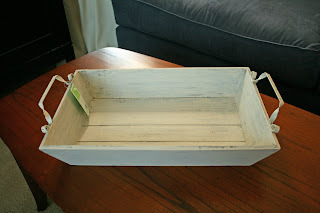 For more frugality, go on over to The Shabby Nest for Frugal Friday! 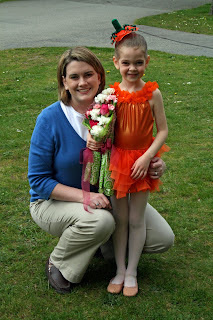 My 5 year old has been taking ballet since she was 3.5 years old and this past weekend was her first spring recital. She has been in two small shows in the past, but this was her first BIG show--and she was so excited! 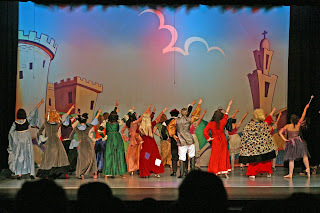 They had performances on Friday, Saturday, and Sunday as well as months of rehearsals leading up to the show weekend. 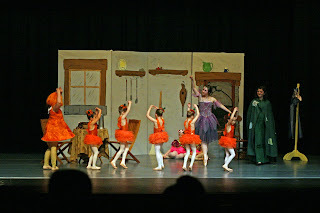 Her dance school performed a variation on Cinderella. I have to say, I was surprised by how cute and *funny* it was! I definitely was entertained! 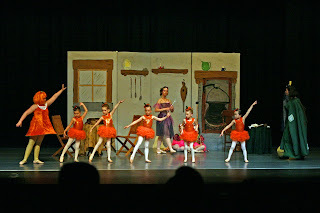 My little girl was a pumpkin--she's the second little pumpkin from the left. She did SUCH a great job. The other little girls in class all are in kindergarten or first grade and my little one (who is the tallest in her class!) is in preschool. 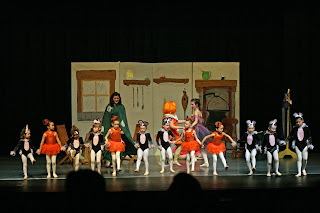 The pumpkin dance was expanded a few weeks ago to include the dance that the mice performed. The teacher realized that the mice were having trouble with their dance, so she had the pumpkins do it with them in the hope that it would help the mice remember what to do. 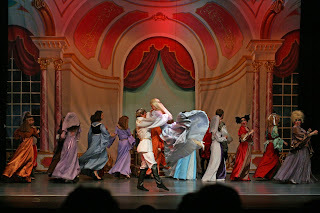 The show was very well done and was a neat spin on the traditional Cinderella. 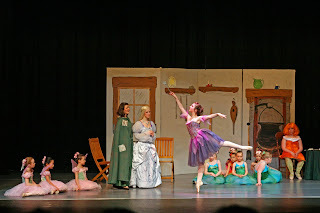 The role of the fairy godmother was my favorite! The sets (except for the kitchen set) were flown in from NYC and were beautiful! 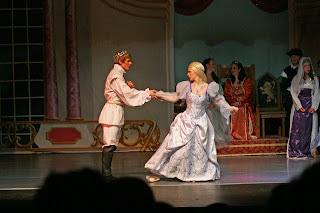 Here is a shot of the Prince dancing with Cinderella. Uh oh, the clock struck midnight! Oh and there even was a bit of disco thrown into the mix! 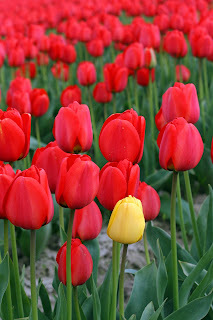 Prince Charming kindly posed for a picture...too bad my little girl was more interested in her flowers than in the prince! 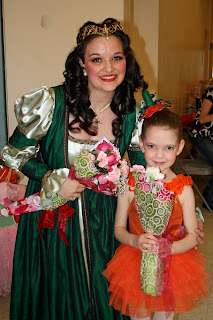 Her ballet teacher danced as the Prince's mother in the show. She used to be Snow White at Disneyworld--doesn't she look the part?! She was thrilled to get flowers after the show and didn't want to let them go! 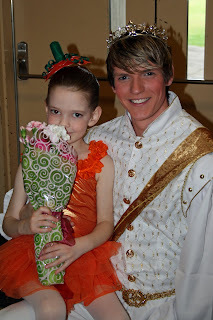 Me with my ballerina! She did such a wonderful job and worked so hard--I'm very proud of her! Hopefully by the next show I'll have a better lens and a tripod for my camera. I'm pretty happy with my shots, but know they can be better--and I'd love to be able to zoom! Still, considering it was a dark auditorium with a brightly lit stage and we weren't allowed to use a flash...these are pretty good! I ended up using my 50mm prime lens (which isn't really suited for these types of shots) so that I could make use of the image stabilization it offered. I also used my gorillapod (kind of a mini tripod) and a remote to reduce camera shake. I definitely have a LOT to learn about my camera though! 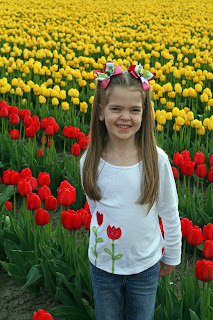 ...a sweet five year old girl with a 104 degree fever. 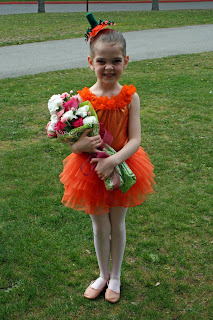 She had three ballet recitals over the weekend and ended up catching the mystery bug that felled numerous other students over the course of the weekend. More about her recital later...for now, I have a sick baby to take care of! And here it what it looks like after two weeks of construction! We have a subfloor with a crawlspace underneath! And we even have our very own mudpit...oh wait, I'm not so excited about the HUGE mess part of all of this. 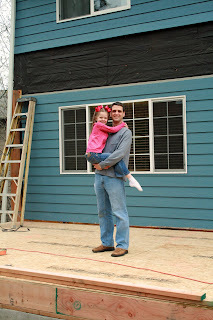 My husband and daughter are standing in the new part of the family room and in front of the sliding door is the new part of the breakfast nook. All of this will be a wide open area just as it is in the house. 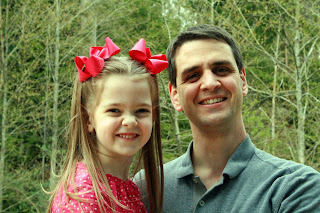 Two of my favorite people in the world! My other favorite person was napping in Mama and Dada's bed with his white noise machine cranked all the way up! 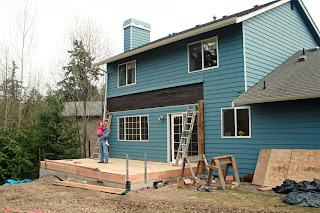 The black "paper" was under the siding and under that is insulation (in some spots...) and then the drywall. 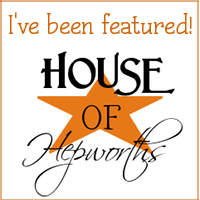 We all were surprised to find out there is NO plywood sheathing on our house! Apparently "single-wall" construction used to be "to code" here. Well, it might have technically been legit, but now we know why our house is drafty!! 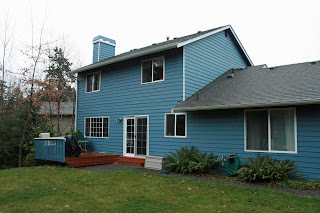 Eventually we're going to have to reside our house (our house is sided with a siding called LP siding...there have been many lawsuits over this faulty siding...it swells up like a sponge if any moisture gets through the paint) and now we know we'll have the added expense of adding plywood underneath it. Ugh! Today they'll be hoisting up a big huge beam to go across the entire space to support the weight of the ceiling and the roof. After that, I believe they'll start framing the walls! Exciting stuff! As you know, we're bumping out the wall of our breakfast nook and family room and making it a bit bigger. We were going to put down new carpet in the family room (and continue the hardwood in the breakfast nook)...but now we're rethinking that plan. My theory is down the road, we will be very limited with our furniture placement if we have the two different floorings. 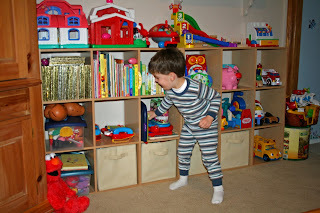 That's what we have now and it is VERY clear where the family room stops and the breakfast nook starts. Plus having one flooring type would make the space look nice and big. The downside to the all hardwood plan? Apart from cost, I need a soft place for my children to play. Plus I have no idea how to select an area rug or where to place it!! I suppose I need two of them...but I don't really have any clue about this. One year ago we bought a big comfy brown sectional. Obviously it is staying since I spent far too much money on it (seriously, WAY too much) even though now it isn't what I would choose for the soon-to-be-expanded space. 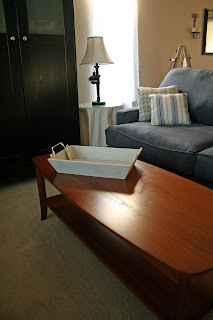 Here is a picture from early last summer...the decorations have changed (hey, where is my black dresser/sofa table!) but you can get an idea of the size of the sectional and the small size of the room! In the back right corner you can see the corner of an armoire--that is on a diagonal and there's about four feet of room space you're not seeing. Basically the wall with the sliding door and the big window over the couch is getting pushed back about ten feet. 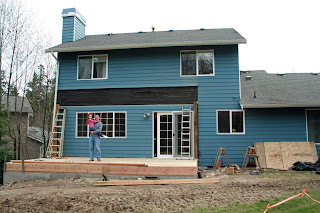 We're updating the fireplace (woohoo!!) and the red wall will be gone too. I loved the red wall when I did it, but I'm so done with it now. 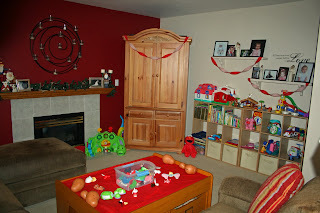 Here is a picture of the room (decorated for Princess's birthday party!) past the armoire. The armoire will be staying in that general spot because we're not moving the cable hookups. I'm not sure if the toys will stay there or not. 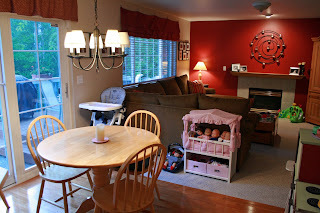 I'm thinking about turning our dining room into a playroom but I'm undecided. So, the couch is BIG. (But comfy!) Currently my thinking is to slide it back four feet or so (toward where the new wall will be. That will leave a larger space between the couch and the television wall (and expose the fireplace more) but still will allow for a significant space between the back of the couch and the window. I'm not sure what we'll do with that space in the immediate future (maybe that's where the toys or train table will go?) but in the long term, I'm sure we'll move our computer there and have some office space. So. 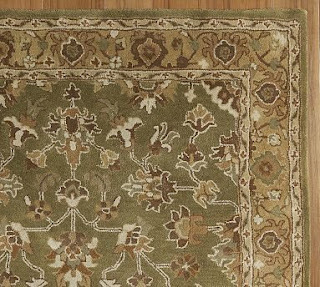 What to do about area rugs? With a couch this huge, what size area rug do I get and how do I place it? I'm thinking 9x13, but is that big enough? How much of the rug needs to go under the couch? Then maybe a separate, smaller, one for the area behind the couch? I'm not buying anything until the space is done, but I'm a planner and *need* to have some sort of plan in my head. HELP! And, of course, how on earth do I choose an area rug pattern? A big rug will be pricey, so I guess I want sort of neutral so that I don't get tired of it. 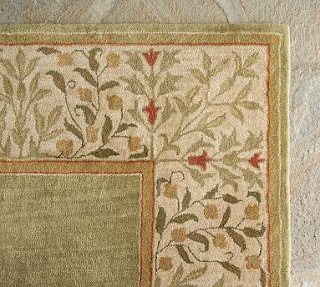 I like this one from Pottery Barn...but will the pretty border be lost if it is partly under the couch? But then I also like this one...totally different style! So many choices and I have no clue what to do! Advice, please! I hope you all had a wonderful weekend! We had a busy but fun Easter weekend. 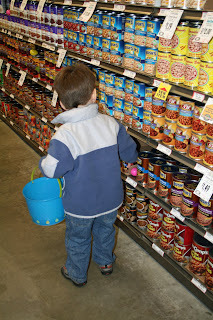 On Saturday before running some quick errands, we went to our wonderful local grocery store for an Easter egg hunt. They had hundreds of eggs hidden all throughout the store--plenty for everyone! 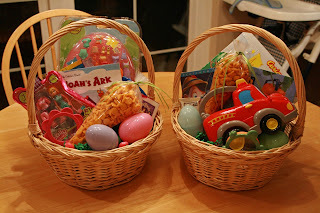 Some of the eggs had candy and others had tickets for prizes. My daughter found one with a certificate for a free slice of pizza at the cafe in the grocery store! Plus every child left with a bag of candy and a kite! My two were thrilled with this! 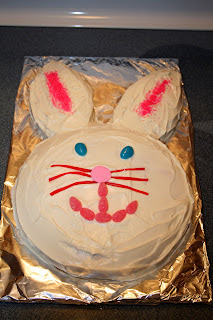 A bunny cake! Not the most professional job, but I just think he's so cute! Super easy to make too--I just used two round cakes. One for his head and one for his ears (plus leftovers.) White frosting, jelly bean eyes and mouth, pulled apart Twizzlers for his whiskers, a Necco wafer for his nose, and pink sugar for the interior part of his ears. 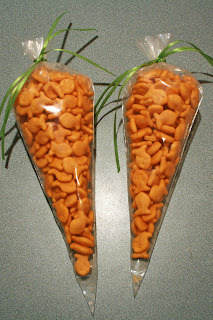 Look at these "carrots" that went in Princess and Handsome's Easter baskets! This idea is from a blog, but I can't remember which one. Anyhow, it worked really well for us because my little girl kept seeing those Reese's faux carrots in the store and really wanted one, but we can't do nuts because of my son's nut allergy. This was a great alternative! 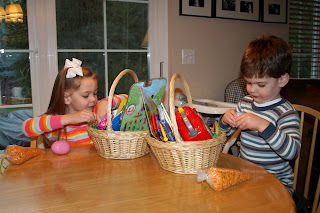 Princess and Handsome were quite pleased with their Easter baskets! 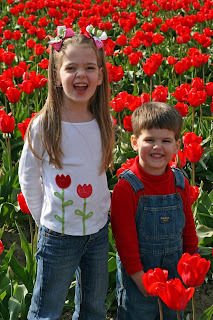 They weren't too elaborate, but they enjoyed everything in them, so that made me happy! 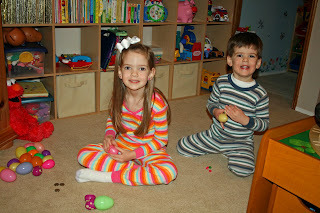 After baskets, it was time to look for eggs in the family room! Princess was a little too quick with finding the eggs, but was a good sport when we made her wait while her little brother found a few! They were so good and it makes me happy to see them getting along so well. Aren't their jammies cute? They're organic cotton from Costco. I love them and wish I had bought more! Next we read a Patricia Pingry book about Easter. It explains Easter really well for their young age and backed up what they've been hearing in Church. We have a lot of her books and like all of them. 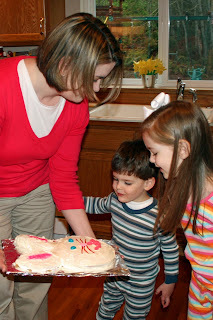 After that I showed them the bunny cake I made--they loved it! Handsome even blew it kisses! 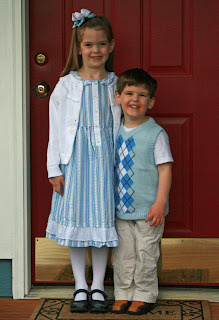 We squeezed in some pictures before leaving for church. And when I say squeezed, I mean squeezed! It was POURING rain out and this was the one dry corner of our front porch! We arrived at Mass nice and early--the "holiday" Catholics tend to show up in droves on Easter, so we wanted to make sure we were able to get our usual pew at the front of Church. It was a very nice service and, for the second weekend in a row, we were selected to bring the gifts up front! The ushers have a soft spot for our children and seem to select us for this honor quite a bit! 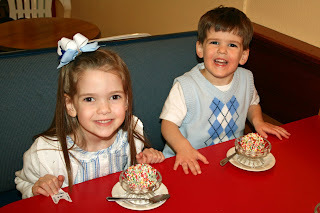 After Mass we went on our traditional drive through the countryside--with the ultimate destination being ice cream! We started this tradition before we had children (back when we lived far from family) and we love sharing it with our children. Although now we're lucky enough to live within a couple of hours of our family, we've claimed Easter as the one holiday we celebrate as a family of four and we love it. We did some geocaching along our drive which made it a lot of fun. It is so wonderful to have an inexpensive hobby that the whole family enjoys...even in the rain! 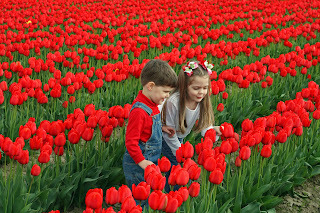 All in all, we had a wonderful Easter weekend and I hope you did too! the BIG project has started!